Scratch Card is a scratchie game from Microgaming where the player purchases a card of the specific value and selects it. Then you scratch off a protective covering, hoping to find a winning combination. It usually consists of several identical symbols. The aim of the game is to find the three identical multipliers in six areas. They can very: x1, x2, x5, x10, x20 and x50. The card value will be multiplied by this multiplier to determine the payout amount. The multipliers that can be found in the card will be written in a special table located in the main window. 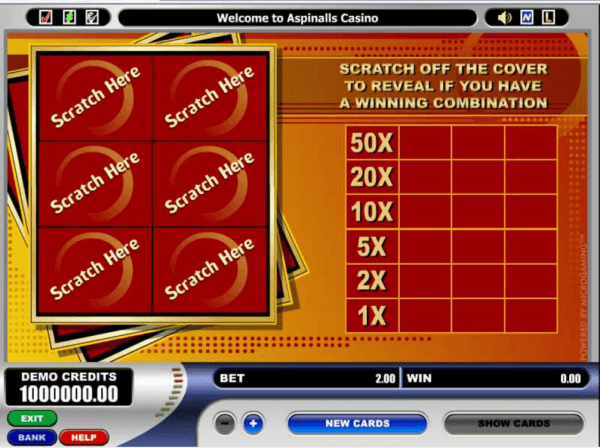 You should select the card value, start a new round, scratch off the covering and finally receive your payout.